Industrial IoT permits easy access to machines and sensors. Another important factor in the international growth of the IIoT market is the efforts put by the governments and chief player in this sector and its growth is projected to rise at a CAGR of 24.3% during the forecast period. One of the examples supporting above estimate is sponsorship received by Government of Germany for a multi-year strategic initiative, called, ‘Industrie 4.0’. This initiative will try to collaborate with the major players from public and private segments including academics to develop a working plan which can align with the future vision of these industries i.e. use of digital technologies in the domestic industrial sector. 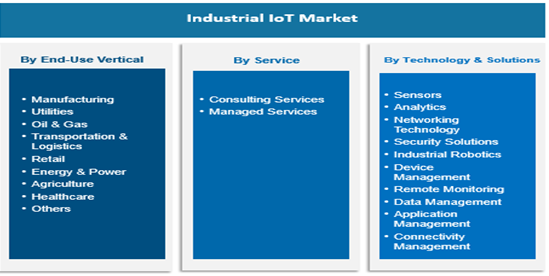 Under end-use vertical in Industrial IoT market, manufacturing industry is leading as compared to other fields like utilities, oil & gas, retails etc. The manufacturing industry is adopting the latest trend of wireless technology and advanced software for their products for collaborating across the system without human interaction through IP connectivity. Major manufacturing industry applications comprise of machine automation, testing equipment, machine vision, production and factory environmental regulation. The few applications who require a large amount of data gathering and analysis such as data visualization, predictive maintenance, and MES are also projected to utilize IIoT broadly with time.The services component of the global IIoT market is estimated to grow faster and at higher CAGR as compared to another two-component shown above till 2026. The technology & solutions market has been categorized as shown above. The solution providers globally are focussing their time and money on the merger of information systems, sensors, and devices across assorted industry verticals. This will help in modernizing the overall operation process and will welcome new business models. IIoT solutions can offer ground-breaking understandings after analysing the data obtained from diverse sources. This will enable industries in the decision-making process on how to improve their offerings. Region-wise analysis as per the research report, predicts that industries in Asia Pacific region will be dominating the market with fastest CAGR. The reason behind this projected growth can be the rising awareness among manufacturing establishments and fast implementation of IIoT in the production line in countries like Japan, China and Taiwan. China is estimated to be the dominating country in the Asia Pacific market as it is home to many manufacturing businesses who are known for their technology-driven attitude. Few of the major players who are actively involved in this transformation and functional with Industrial IoT are – Cisco Systems, Inc., IBM Corporation, Microsoft Corporation, General Electric Company, Intel Corporation, Siemens AG and so on.